Everyone knows there are just two world heavyweight champions right now: WBA/IBF/WBO ruler Anthony Joshua and WBC boss Deontay Wilder, but this will not stop the winner of the upcoming fight between Manuel Charr and Fres Oquendo from calling themselves a “world champion,” the winner of the May 4 fight walking away with the “regular” WBA belt currently held by “Diamond Boy” Charr. In truth, as most everybody knows, Charr-Oquendo is a pretty dull-looking fight, one that has no business calling itself a “world” title fight (the 37-8(24) Oquendo, though a talented fighter in his day, has done nothing to earn any manner of title chance, the 45 year old last winning a fight in 2014!). Charr showed heart in beating the huge Alexander Ustinov in November to win the strap, but no-one is looking at him as an authentic world ruler. Still, the winner of Charr-Oquendo could pick up a decent payday, as Dillian Whyte has been confirmed by WBA president Gilberto Mendoza as a potential challenger for the winner – the idea, Mendoza told Sky sports, is to have one established, universally accepted WBA heavyweight champion. 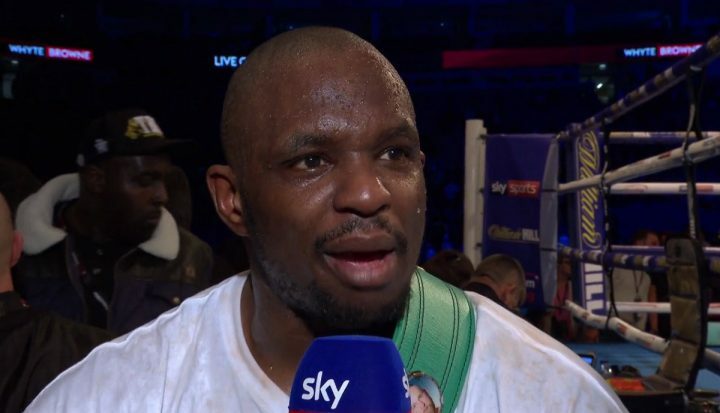 Whyte, should he beat the Oquendo-Charr winner, could then fight real champ Anthony Joshua in a big-fight rematch that would see one man walk away as THE WBA champ. This is just one of the options Whyte has, along with a possible fight with Alexander Povetkin and maybe even Wilder. So although the May fight set for Chicago is, in the opinion of many, a bad joke, the winner could, potentially (should he fight and upset Whyte) walk into a big fight; a “real” world title fight. Who wins on May 4, Charr or Oquendo? Anything could happen, but considering Oquendo’s age and inactivity, Charr, 31-4(17) and 33 years of age, has to be looked at as the favourite. And who knows, maybe Charr gives Whyte a good, exciting fight later this year. Charr is not short on guts and heart, that’s for sure.